Find when the next regularly-scheduled buses are due at your stop. View ABQ RIDE bus routes with bus STOP number signs in a larger map. The TXT2RIDE service allows passengers to quickly access ABQ RIDE schedule information. All you need is a phone capable of text messaging, an ABQ RIDE BUS STOP number and an ABQ RIDE route number. 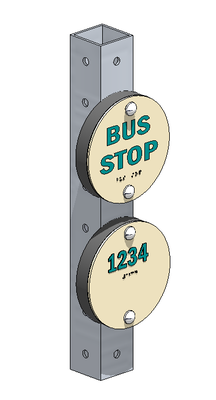 Every bus stop in the ABQ RIDE system will be identified with a unique BUS STOP number sign puck. See the map of routes with installed BUS STOP numbers. Step 2: Enter: the 4-digit bus STOP number followed by a space and the route number. You will receive a text message response with the next two scheduled departure times for the bus route and bus stop selected. If the bus stop serves more than one bus route, you need to compose a separate text message for each route. Use your QR Code reader to scan this code to automatically compose a text message. Bus STOP Numbers are available at ABQ RIDE bus stop pucks and online. To find the bus STOP number, look for the round puck with a tactile blue 4-digit number posted on the bus stop pole four to five feet above the ground. Most pucks will face the sidewalk. The bus STOP number also appears in Type II Braille below the tactile number. See the map of routes that have bus STOP number pucks installed. Option 1: Using ABQ RIDE "Plan Your Ride" Trip Planner. Note for the Google Maps Application for Android Mobile Devices and iOS: Selecting a bus stop icon will not reveal bus STOP numbers, only schedule data.